Heavy Duty DC Brake: designed for a long service life, the brake location allows for quick access & easy inspection. Durable & Lightweight Housing: cast aluminum. Black powder coated finish for low visibility. Gearing: helical design for long wear life and smooth operation. Load Chain: Designed and manufactured in the USA by Columbus McKinnon. Star Grade chain is zinc plated to protect against corrosion. 2-ton, single-reeved units feature 10 mm load chain as standard. Optional black finish available. Duty Cycle: H-4 duty rated for heavy duty application. 2M+ FEM class. 50% Duty Cycle or 300 on/off per hour. Overload Protector: designed to prevent lifting of excessive overloads. Helps prevent lifting of dangerous overloads. Lifetime Warranty: the industry's best. Double DC Brake: two independent acting DC Brakes for redundant braking. Field installation kit available. AC Electric Brake Encoders Available: incremental & absolute. Chain Bags: cloth type bags easy-to-mount. Alloy Latchlok Hooks: remains locked until released by the operator, even if chain goes slack. Direct Control Unit: Featuring a single cable, this Direct Control Unit can be used as part of a system with multiple units with a single control. 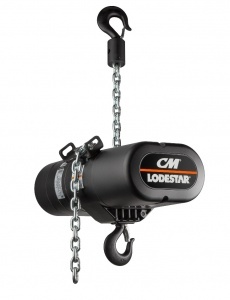 The Lodestar is compatible with most Direct Control Motor Controllers.